My job title is a magnet for spam, and the predictable format of email addresses across companies means I have to work my way through a load of targeted spam everyday. Spam filters do a great job, but targeted spam is difficult to identify, as it’s sent person to person, it’s just unwanted direct e-mail. 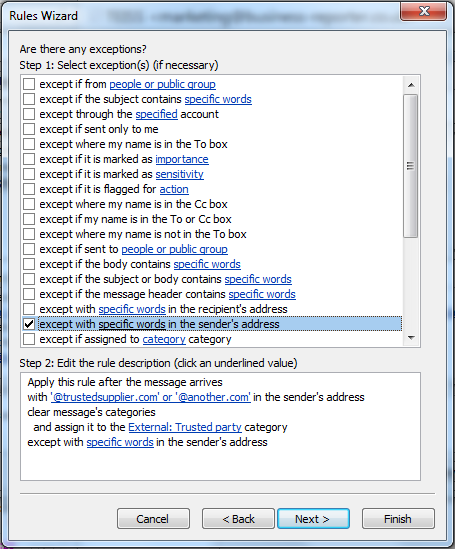 To prevent me from auto-ignoring mail, I highlight mail from External Trusted Senders, and External Untrusted Senders, so I can look at these separately. 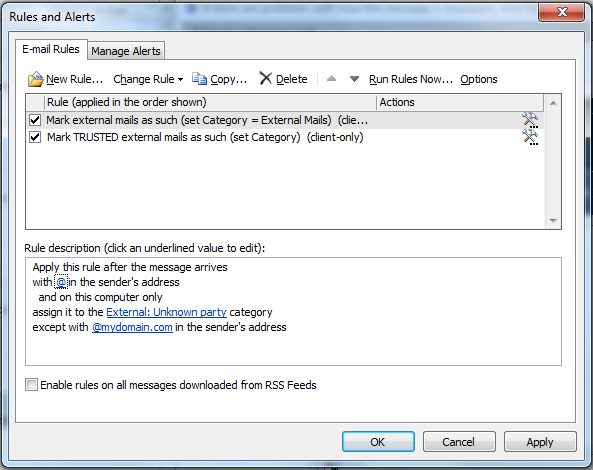 I setup categories for External Trusted Senders, and External Untrusted Senders. The inbox view automatically highlights these as such, so they are easy to ignore day-to-day (I prefer this to auto-deleting them, as there’s always the odd new sender I haven’t added to my trusted list). 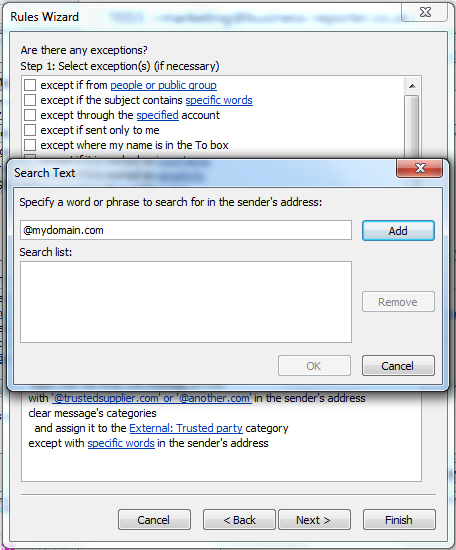 I then use a search folder to separately view the External Untrusted Sender emails. I quickly look through this folder every week to spot any external senders I need to add to my trusted list, I just select the rest of the emails and delete them in one go! At this point, I feel quite smug! 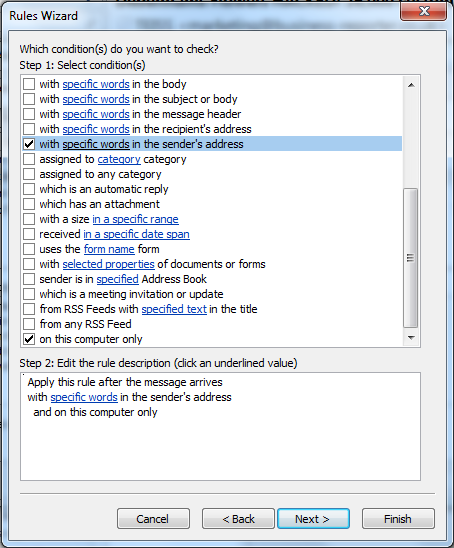 Tick the checkbox next to “with specific words in the sender’s address”, and “on this computer only” Then click the “specific words” link in the lower section of the window. 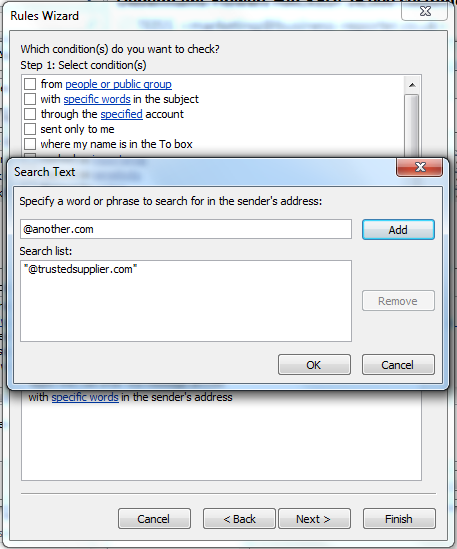 Specify “@” as the word/phrase, click “Add”, and then “OK” Click “Next” once, when returned to the previous window. 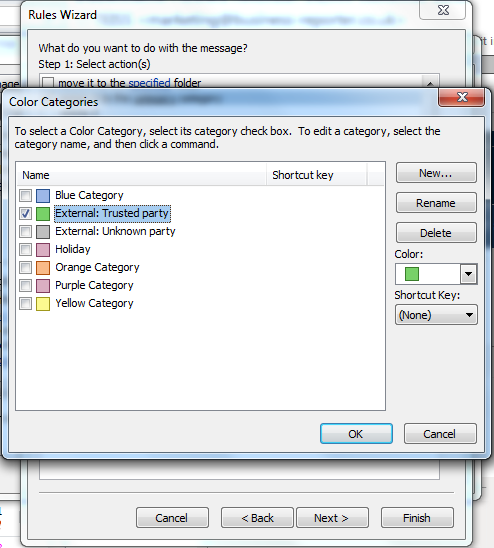 Tick the checkbox next to “assign it to the category” Then click the “category” link in the lower section of the window. 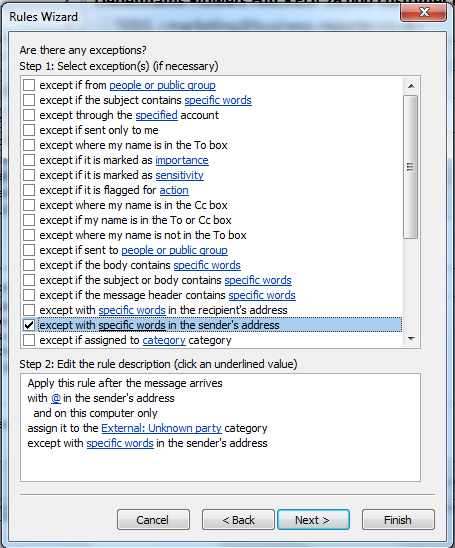 Click “New”, and create a category called “External: Unknown party”. 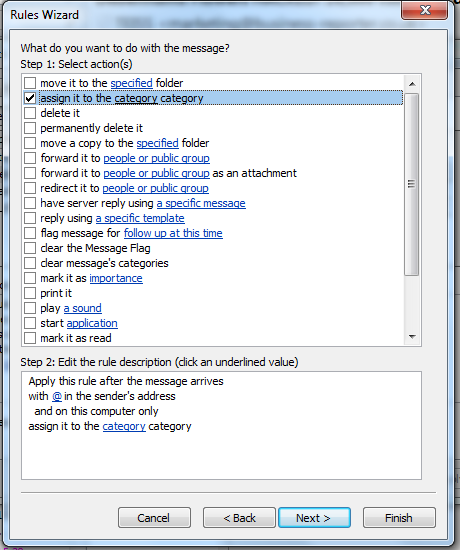 Select a suitable colour to flag such mails (I choose grey to reflect these are unknown mail senders). Ensure the checkbox for this is ticked before clicking “OK” to return to the previous window. Click “Next” once, when returned to the previous window. 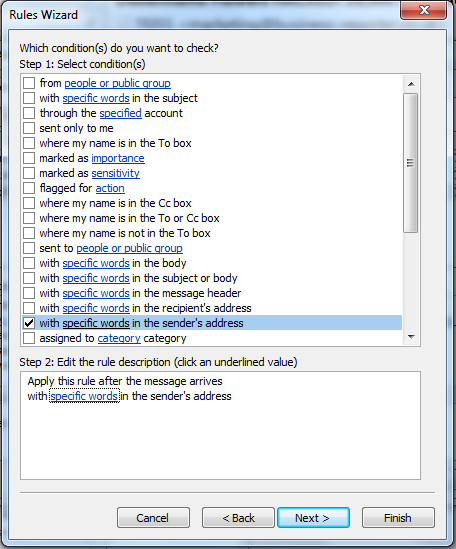 Tick the checkbox next to “except with specific words in the sender’s address” Then click the “specific words” link in the lower section of the window. 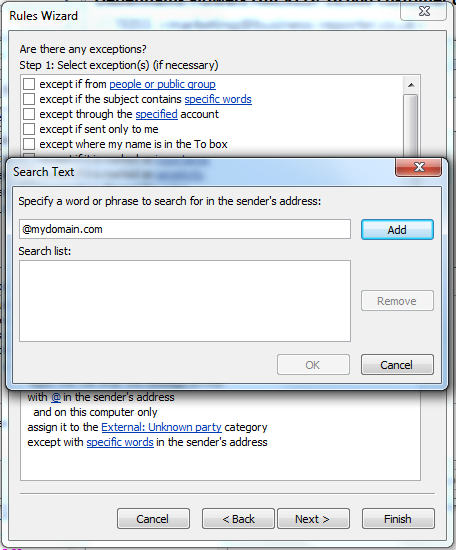 Specify “@mydomain.com” (replacing mydomain.com with your internal company domain name). Click “Add”, add any further internal domain names (if applicable), and then “OK” Click “Next” once, when returned to the previous window. 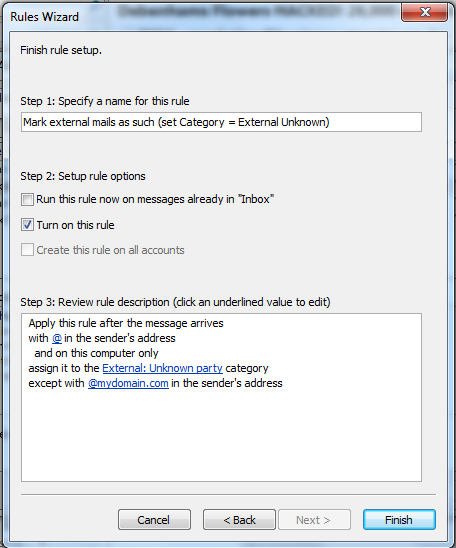 Provide a name for this rule reflecting that it marks ALL external mails as External unknown). Click finish when done. 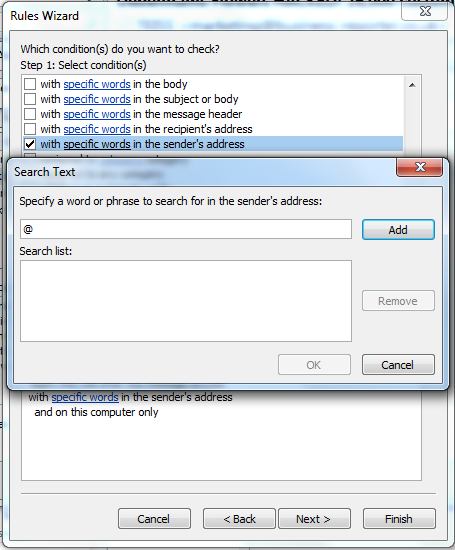 Tick the checkbox next to “with specific words in the sender’s address” Then click the “specific words” link in the lower section of the window. Add domain names for your trusted external parties. Start each one with the “@” symbol. e.g. “@microsoft.com”. Click “Add” between each domain. Click “OK” when you have add your full list. Click “Next” once, when returned to the previous window. 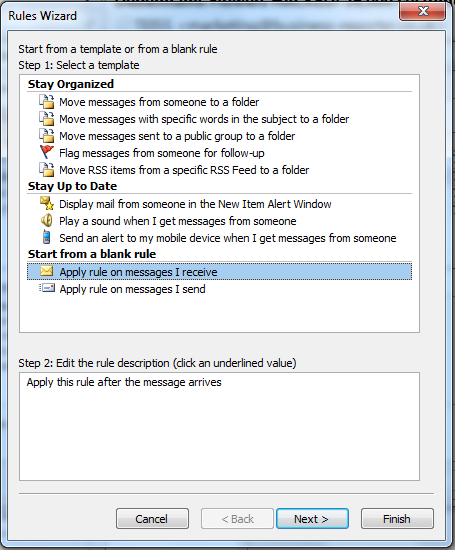 Tick the checkbox next to “assign it to the category”, and “clear message’s categories”. Then click the “category” link in the lower section of the window. Click “New”, and create a category called “External: Trusted party”. 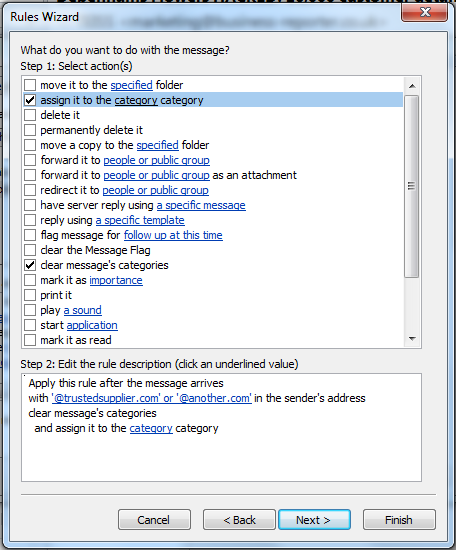 Select a suitable colour to flag such mails (I choose green to reflect these are trusted mail senders). Ensure the checkbox for this is ticked before clicking “OK” to return to the previous window. Click “Next” once, when returned to the previous window. 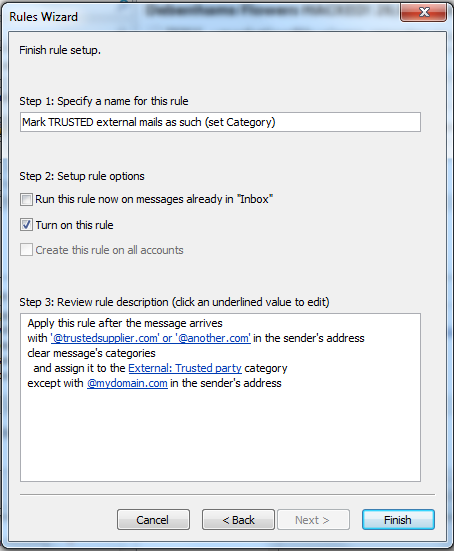 Provide a name for this rule reflecting that it marks Trusted external mails as External Trusted). Click finish when done. 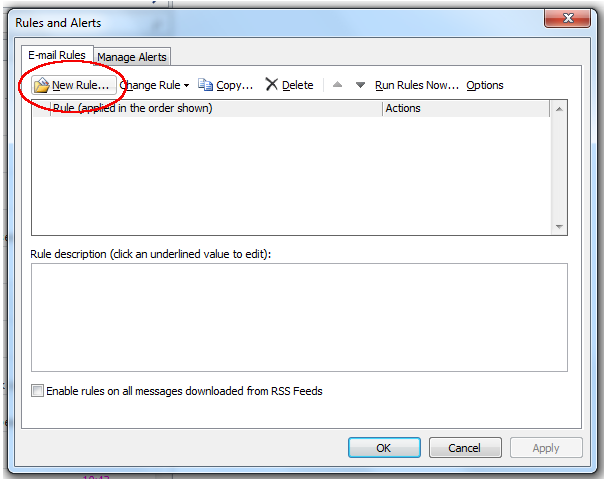 Finally, make sure both new rules have a ticked checkbox to their left. Then click “apply”. Optional: At this point you could have “Run Rules Now” against your Inbox, to see the impact. When done, click “OK”. 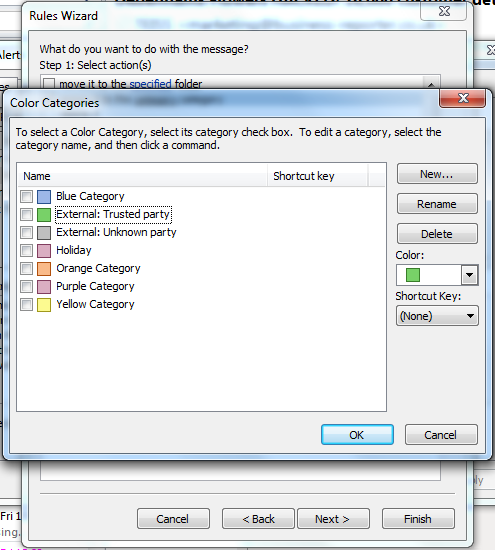 The result is that you will have these colour flags in your Inbox, to help you skip possible spam. 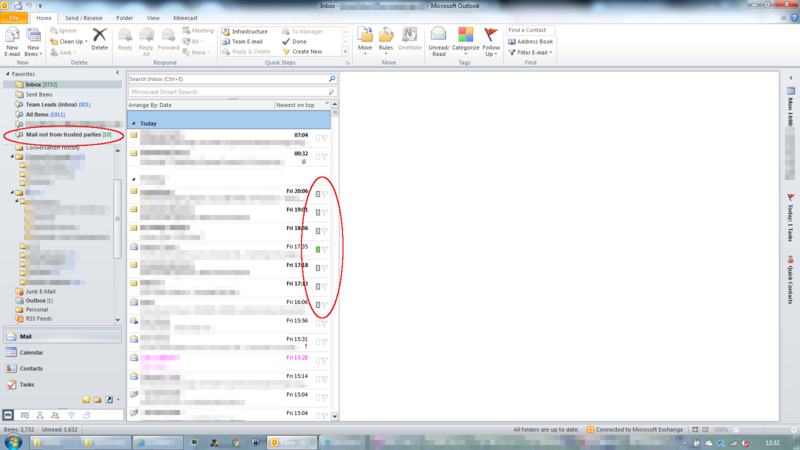 I recommend setting up a search folder to display all mails in the Inbox that have the Unknown party category. You are likely to need to edit the Trusted party rule regularly initially, while you identify a list of domain names that you trust. I now have this working with a list of all our suppliers and trusted partners, and find it a huge help in the fight against targeted spam. Please leave comments if this is helpful, as it’s great to know if my effort was worth it!